Whilst many of our customers are looking for an escape from the British weather and choose not to stray too far from the beach and their hotel, the Cape Verde Islands have an extraordinary amount to offer and those that venture a little further afield will experience more of the true personality of the islands, their landscapes and their people. For us, a tailormade holiday is all about freedom - freedom to choose what suits you best, freedom to select from our finest hotels and the amazing range of islands on offer; freedom to use your imagination and build the perfect holiday. We can arrange any combination of islands or hotels as long as the flights are possible, just give us a call to discuss your ideas. 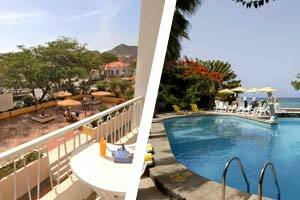 4 nights at Oasis Porto Grande Hotel and 3 nights at Odjo d'Agua Hotel. Experience vibrant culture and charming locals on São Vicente and Sal. Staying 4 nights in Mindelo, the second largest city in the archipelago, fall in love with the colonial architecture and cobbled streets and the local’s passion for music; from the delicate melancholy of the traditional mornas to the more frantic tempos of funana. On Sal, Santa Maria awaits with stunning stretches of beach and ever growing numbers of bars and restaurants. 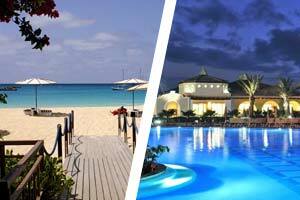 4 nights at Hotel Morabeza and 3 nights at Iberostar Club Boa Vista. 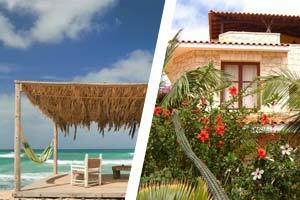 Spend time in two of our most popular hotels and get to know the stunning islands of Sal and Boa Vista. With clear waters and pure white sands, Sal is a beach lover’s paradise offering a mix of water sports and a vibrant atmosphere in the town of Santa Maria. Boa Vista is home to the most dazzling beaches on the archipelago and has an ever-changing landscape sculpted by the wind. Saharan like oases are dotted around the interior and depending on the time of year, turtles can be spotted on the beaches.